Place olives in a food processor and process for a few seconds until they form a rough paste with some chunks of olives here and there. Add pine nuts to olives and process for a few more seconds making olives and nuts into a paste. Transfer to a bowl and mix in remaining ingredients. You should have a thick paste glistening with oil. Serve with heavy breads, crackers, or pita bread. Preheat oven to 375 degrees. Lightly grease a 7 x 11 inch baking dish. In a medium bowl, mix the cream cheese and miracle whip until smooth. Mix in the spinach, artichoke hearts, and Parmesan cheese. Season with garlic and lemon juice. Spread evenly into the prepared baking dish. Bake covered for 20 minutes. Remove the cover, and let the dish bake uncovered for 5 more minutes, or until the surface is lightly browned. In a medium bowl, whisk together the flour, baking soda, salt, cinnamon, ginger, cloves, and allspice. In the bowl of a stand mixer fitted with the paddle attachment, cream the shortening with the sugar until light and fluffy, about 5 minutes. Add in the egg and beat well. Scrape down the sides of the bowl with a rubber spatula. Beat in the molasses. With the mixer on low, add in the flour mixture and ginger and mix until just combined. Use your rubber spatula to fold in any bits of flour on the sides and bottom of the bowl. Chill the dough in the refrigerator until firm enough to handle, about 2 hours. Line a cookie sheet with parchment paper (bake one batch at a time). Preheat the oven to 350 degrees. Place some sugar in a small bowl. Shape the dough into 1 1/2-inch balls and roll in the sugar to coat. Place on the prepared pan, spacing 2 inches apart. 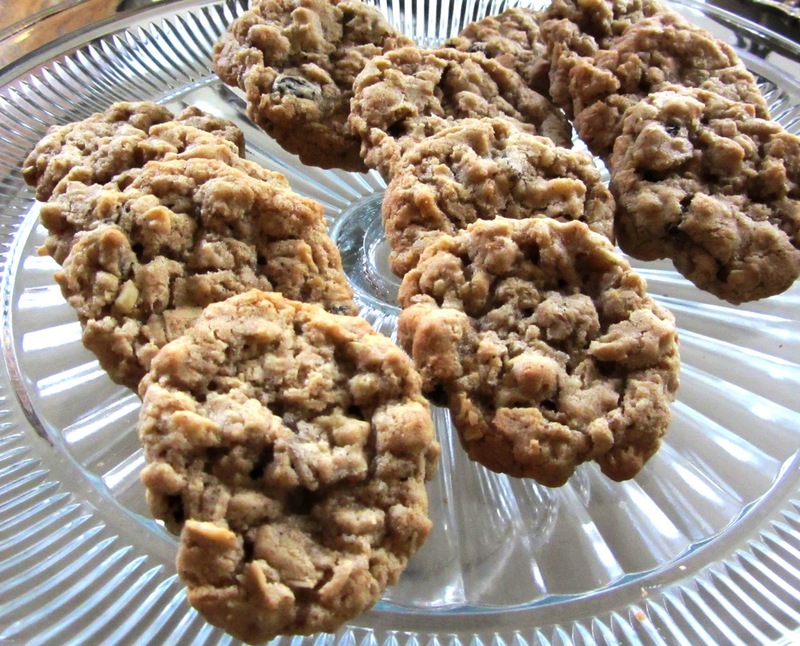 Bake until the cookies are crackly and the centers are almost set, 9 to 11 minutes. Allow the cookies to cool in the pan for 3 minutes before transferring to a wire rack to cool completely. Line a pie pan with pie dough forming a shell. Preheat oven to 425 degrees. Mix pumpkin, milk, sugars, salt, cinnamon, ginger, pumpkin pie spice, cloves, and egg until well blended. 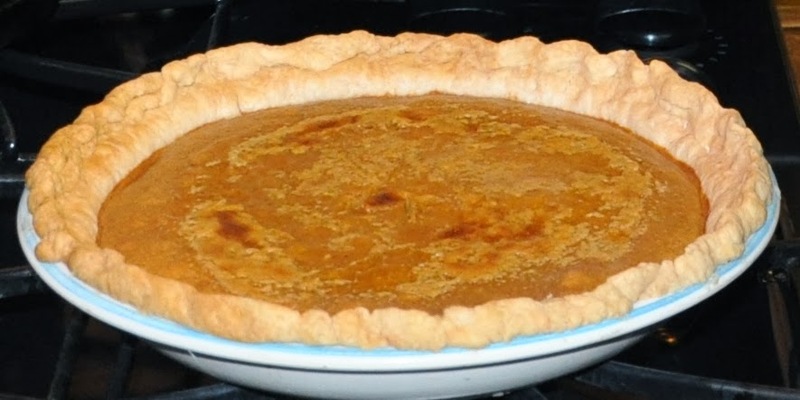 Pour the mixture into the pie shell. Bake 15 minutes at 425 degrees, then reduce heat to 350 degrees and bake about 45 minutes longer until an inserted knife comes out clean. Serve with whipped cream flavored with bourbon. 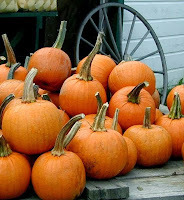 *To cook pumpkin, wash and cut it in half crosswise. Remove seeds and strings. Place it in a pan, shell side up, and bake it in a 325 degrees oven for 1 hour or more, depending on size, until it is tender and begins to fall apart. Scrape the pulp from the shell and put it through a ricer or strainer or blender. Butter sides and bottom of a 9x13 pan and set aside. Place bread cubes in a large mixing bowl. In a separate bowl, whisk eggs together and add pumpkin puree. Whisk until smooth. Mix in pumpkin spice egg nog. Add brown sugar, pumpkin pie spice, cinnamon, salt, and vanilla and whisk until combined. Pour mixture over bread cubes and very gently toss until covered. Let sit 2-3 minutes and then toss again, making sure all bread cubes get covered in some egg mixture. Place entire mixture in prepared 9x13 inch pan, cover, and refrigerate overnight. In the morning, take french toast pan out and set at room temperature while you preheat the oven to 350 degrees. Uncover the pan and sprinkle crumb topping evenly over the top. Bake for 45-55 minutes, until puffed and golden all over. Remove and let cool for 10 minutes or so and then cut into squares and serve. Serve with softened or melted butter, 100% real maple syrup, and sweetened whipped cream sprinkled with pumpkin pie spice. Frozen hash brown must be thawed. Preheat oven to 375 degrees. In a large mixing bowl mix together melted butter, sour cream, cheese, pepper, salt, and chopped onion. Drain any moisture from hash browns and fold into sour cream mixture. Spread hash browns into a 13 x 9 baking dish. Bake for 45 minutes to 1 hour until brown and crisp on top and along the edges. Cut into appropriate sizes and serve. Preheat oven to 350 degrees. Spray a 13 x 9 cake pan with non-stick cooking spray. In a medium bowl mix together with an electric mixer the cream cheese, sugar, egg, and vanilla on medium-low speed until creamy. Set aside. In a large bowl cream together butter and sugar. Add eggs one at a time. Add vanilla. Slowly pour in flour mixture alternating with sour cream until all is combined. Spread half of the batter into the prepared cake pan . Spread the cream cheese filling evenly on top of the batter. Top with the remaining cake batter and smooth with a spatula. Add sugar, flour and chilled butter in a small bowl. Stir using a fork or pastry blender until the mixture is crumbly. Sprinkle the topping on the top layer of the cake batter. Bake for 40 - 45 minutes until a tooth pick inserted in the center comes out clean. Cool on a rack. These waffles take some time because they have a cream filling and they are baked in the oven for 20 minutes. But they are fantastic! If you are a waffle lover and love fruit and waffles this is a recipe for you. You can actually make the pastry cream and the waffles a day ahead then assembly the morning you plan to serve them because they do bake in the oven. Preheat waffle iron. Sift flour, baking powder, sugar and salt into a large bowl. Beat eggs in a small bowl until fluffy. Make a well in the flour; pour milk, eggs, vanilla and butter into the well; mix just until smooth. Spray preheated waffle iron with non-stick cooking spray. Pour mix onto hot waffle iron. Cook until golden brown Cook all the waffles. Preheat oven to 350 degrees. Prepare the cream. In a saucepan combine sugar, flour, salt and milk over medium heat. Cook stirring until mixture thickens, about 5 minutes. In a small bowl beat egg yolks slighly and ad slowly to milk mixture. stirring constantly, cook until thickened. Remove form heat and add vanilla and stir. Chill until ready to use. Can be made the night before. Spray a jelly roll pan with non- stick cooking spray. 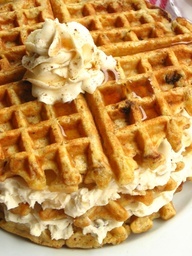 place a layer of waffles along the bottom of the pan; using 1/2 of the cream spread a layer of the cream on the waffles. Layer on top of the cream 1/2 of the strawberries and blueberries. Top with another waffle, spread the rest of the cream on the waffles. Top with the remaining strawberries and blueberries. Bake 20 minutes at 350 degrees. Top with whipped cream if desired. Serves 8. Position racks in the upper and lower 2/3 of the oven and heat the oven to 325 degrees. Spray two rimmed baking sheet pan with non-stick cooking spray. In a large bowl, mix the oats, almonds, vegetable oil, honey, vanilla, almond extract, salt, coconut, and cinnamon. Mix together to spread honey and oil evenly over oats. Use your hands if necessary. Divide the mixture between the two pans and spread in and even layer. Bake 20 minutes, stir, and switch the position of the pans. Bake until the oats are golden and brown and the nuts are just toasted. Let cool completely on the pan. The oats crisp up as they cool. When completely cool store in plastic container. Add raisins if desired. This recipe can be found on page 12 of the "Breakfast and Beyond Cookbook"
Preheat oven to 350 degrees. Cream shortening and sugars together, add eggs and vanilla and beat well. Sift together flour, salt, baking soda, and spices. Add to shortening mixture and mix well. 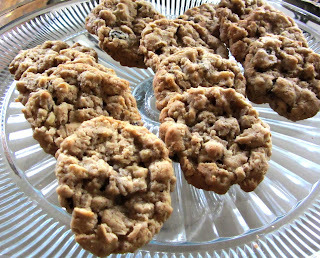 Add oats, walnuts and raisins; fold in to incorporate. Spoon out on to cookie sheet. Bake for 10 -12 minutes; remove to wire rack. Cool. Makes 2 dozen. This recipe can be found in the Breakfast and Beyond Cookbook on page 187. Preheat oven to 375^. Combine sugar, pepper, mustard and water and make a paste. Take a large baking sheet and spray with non-stick cooking spray. Place sliced bacon on the cooking sheet and baste each slice with sugar mixture. Bake for 30 - 40 minutes to your preferred crispness. Preheat oven to 350^. Slice the fresh sourdough bread into 1 1/2inch slices and then slice in half without splitting it all the way in order to make a pocket for the ricotta stuffing. 14 pieces. In a bowl mix together ricotta cheese, sugar and some whipped cream, to thin the mixture then set aside. In another bowl combine egg, half and half, cinnamon, maple syrup, and vanilla. Beat well and pour into a shallow bowl for dipping the bread. Gently open the split slice of bread and spoon about 2 tablespoons of ricotta cheese mixture into pocket and spread evenly. Place stuffed bread into batter mixture and allow to sit for a couple minutes to soak and then turn over on the other side and soak. Spray 2 - 13 x 9 pans with non- stick cooking spray place soaked break into the pans. Bake 40 minutes; slices with rise and brown. About 10 minutes before the french toast is finished baking slice bananas and toss in cinnamon and sugar. Figure about 6 slices of banana per slice of bread. 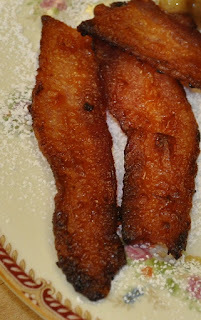 Caramelize the bananas in 2 pans or 2 different batches. Just before serving melt 1/4 cup of butter; when butter is melted and hot pour in bananas that are coated with cinnamon and sugar. Toss as they cook and caramelize. Butter will brown and thicken; pour over plated french toast. Garnish with whipped cream. Make orange juice to package direction in a blender. Pour half of the juice into a pitcher, leaving half of the juice in the blender. Add mango and banana. Blend a minute or so to completely blend in banana. Pour into the pitcher with the remaining juice, stir, chill and serve. 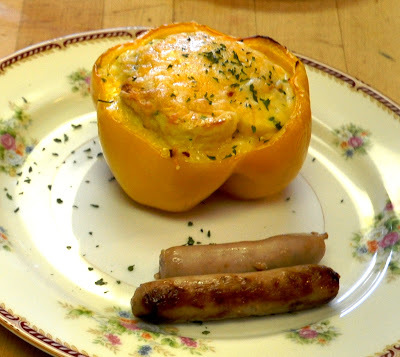 Peppers for Breakfast is a delicious and colorful dish to serve for any breakfast or brunch. It is a favorite at the Avenue Hotel Bed and Breakfast served with sausage or ham. Removes the top 1/2-inch of each pepper. Discard the tops and seeds. Arrange the peppers, cut side up, in a 8 x 8" glass baking dish. Dice onion and saute; add the thyme and stir for one minute. Add to potatoes. Fill the bottom of each pepper evenly with hash browns and bacon. In a large bowl, combine the eggs, cheese, milk, baking mix, sour cream, green onion, salt, and pepper. Whisk until combined. Evenly distribute the egg mixture into each pepper. Bake for 40 minutes add cheese to the top to melt and lightly brown. Bake until a wooden pick inserted in center comes out dry, about 45 minutes. Removed from the oven, garnish with cheese and serve immediately. It's National Banana Bread Day!!! 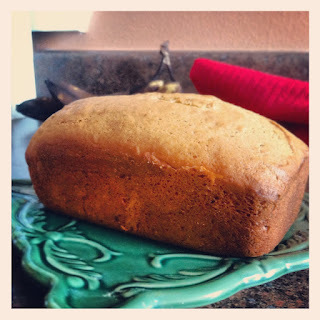 It's National Banana Bread Day! Here's our Banana Peanut Butter Bread for our "Breakfast and Beyond" Cookbook to celebrate!!! Directions: Grease a 9 x 5 x 3 inch loaf pan. Thoroughly stir together dry ingredients. Cream butter and sugar. Beat eggs until thickened and lemon colored; add to butter mixture and blend. Mash bananas with a fork, blend in peanut butter. Stir in flour mixture in about 4 additions, alternately with banana mixture until just smooth each time. Bake at 350 degrees for 50 to 70 minutes. Let stand on wire rack for 10 minutes, loosen edges, and turn out on rack, turn right side up. Cool completely. Bloom the spices. ** Heat 4 tablespoons butter in skillet over medium heat until melted. Continue to cook, swirling pan constantly, until butter is brown and has a faint nutty aroma, 2-4 minutes. Add spices and continue to cook, stirring constantly, 15 seconds; remove from heat and allow to cool about 30 minutes. Sift together flour, salt, sugar baking soda. Mix together the buttermilk and the egg yolks. Stir in the spiced butter and vanilla. Spray the waffle iron well with non-stick cooking spray and preheat it. Stir the wet ingredients into the dry. Beat the egg white in a separate clean bowl with a electric mixer until they hold peaks. Stir them gently into the batter. Add carrots, walnuts, and raisins. Stir gently to combine. Spread a ladleful or so of batter onto the waffle iron and bake until the waffle is done, usually 3 to 5 minutes, depending on your iron. Spray iron with cooking spray between waffles as needed. Part of our breakfast at the Avenue Hotel B&B is a fresh baked good. First I start our coffee, then my next job is to start muffins, or coffee cake, or scones, or cinnamon rolls just depends. Muffins are a favorite. I have over 2 dozen different recipes in my Breakfast and Beyond Cookbook that I use and this is one of them. In a large bowl, combine the dry ingredients. In another bowl beat eggs, milk, oil and zest together. Stir in dry ingredients just until moistened. Fold in Craisins and almonds; reserve just a few for the tops of the muffins. Fill muffin cups 2/3 full sprinkle topping on. Bake at 375^ for 18 -20 minutes or until toothpick comes out clean. Cool 5 minutes before removing from the pan. Makes 12. Combine all four ingredients in a small bowl. Incorporate well. This morning when I was making this muffin I thought a topping would be nice and jazz it up a bit. So the topping is from my Orange Sour Cream Muffin, minus the poppy seed, add almonds. I thought it added a nice texture to the look of the muffin and a sweet crunchy top. Combine all dry ingredients, then stir in all liquids until blended. Bake in greased or sprayed muffin tins at 350 degrees about 20 minutes. Don't use paper liners. Serves 14. Preheat oven to 350^. Spray a mini muffin tins with nonstick cooking spray. Combine bread crumbs, olive oil and salt. Cook the macaroni for 8-9 minutes. Drain and place in pan. Stir in the butter and egg until macaroni is well coated. Reserve 1/2 cup of sharp cheddar cheese. Stir in remaining cheeses with milk and truffle oil. Spoon into the prepared muffin tins. 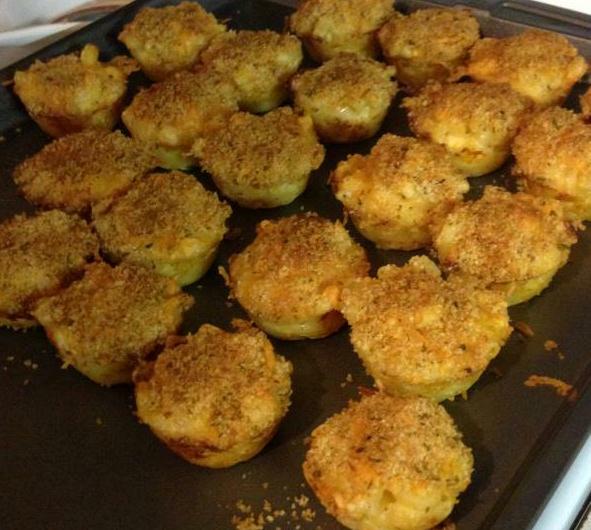 Sprinkle with reserved cheese and bread crumbs. Bake 30 minutes. Let cool for 5 minutes before removing. Order cookbook www.avenuehotelbandb.com scroll to the red box.